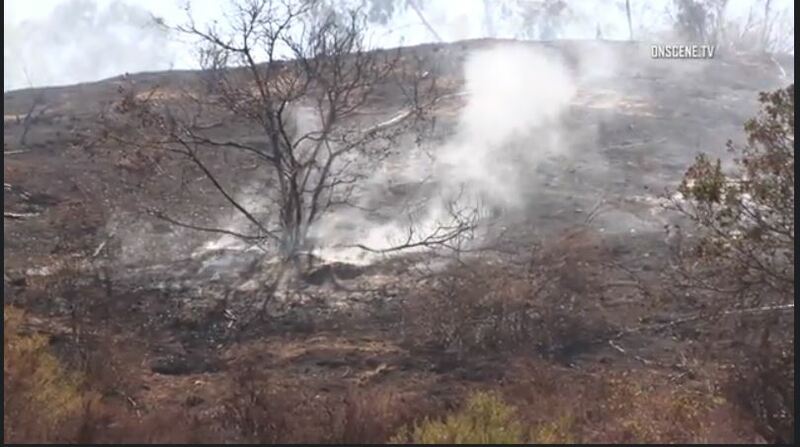 A small brush fire blackened swaths of open land Tuesday in a rural neighborhood north of Fallbrook, prompting a few residential evacuations and briefly threatening a home before firefighters gained control of the flames. The blaze, dubbed the Cathy Fire, erupted for unknown reasons about 1 p.m. off Daily Road and Lynda Lane in De Luz, just south of the Riverside County line, according to Cal Fire. Sheriff’s deputies cleared people out of two homes near Ross Lake and closed traffic lanes in the area as ground crews and personnel aboard air tankers and water-dropping helicopters worked to subdue the flames. The firefighters had the spread of the blaze halted at about four acres in just over an hour, the state agency reported. No structural damage or injuries were reported.